Western blot analysis of extracts from various cell lines using YTHDF1 Antibody. Immunoprecipitation of YTHDF1 from MCF7 cell extracts. 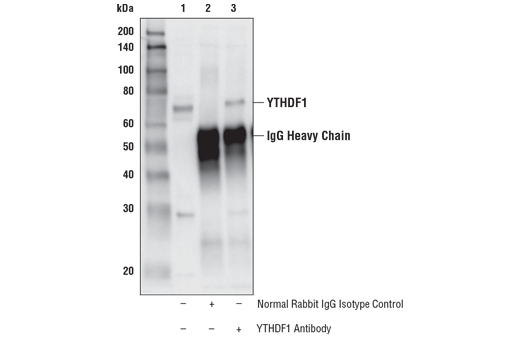 Lane 1 is 10% input, lane 2 is Normal Rabbit IgG #2729, and lane 3 is YTHDF1 Antibody. Western blot analysis was performed using YTHDF1 Antibody. 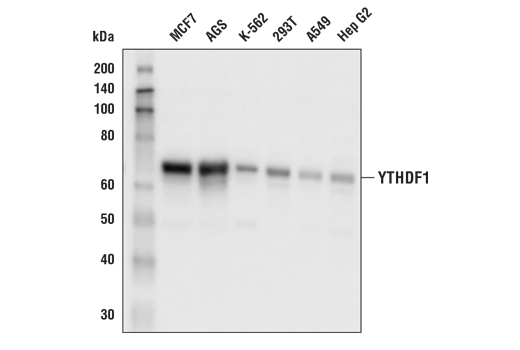 YTHDF1 Antibody recognizes endogenous levels of total YTHDF1 protein. Polyclonal antibodies are produced by immunizing animals with a synthetic peptide corresponding to residues near the carboxy terminus of human YTHDF1 protein. Antibodies are purified by protein A and peptide affinity chromatography. N6-methyladenosine (m6A) is an abundant RNA modification that plays an important role in mRNA splicing, processing, and stability. The m6A modification is specifically recognized by members of the YT521B homology (YTH) domain-containing family (YTHDF), consisting of YTHDF1, YTHDF2, and YTHDF3. All three members of the YTHDF family are primarily cytosolic proteins that share similar sequence and domain structure, including a conserved C-terminal YTH domain that specifically interacts with m6A (1). Despite these similarities, recent studies suggest that YTHDF proteins are involved in distinct regulatory functions with minimal overlap. Specifically, YTHDF1 binding has been reported to promote enhanced mRNA translation, but has no measurable effect on mRNA stability (2). Conversely, YTHDF2 binding appears to promote mRNA degradation, but has minimal effect on translation efficiency (3). The function of YTHDF3 is less clear, but it has been proposed to function as an auxiliary protein for both YTHDF1 and YTHDF2, helping to promote either increased mRNA translation or decay, respectively (4). Additional studies offer a different viewpoint, suggesting that all three YTHDF proteins initiate mRNA degradation (5), or mediate increased mRNA stability and protein expression (6), promoting the idea that these proteins may carry out similar rather than distinct functions. Shi, H. et al. (2017) Cell Res 27, 315-28. Du, H. et al. (2016) Nat Commun 7, 12626. Kennedy, E.M. et al. (2016) Cell Host Microbe 19, 675-85.